The Matias Family: My Faith Box! Recently, I randomly entered a drawing to win a free My Faith Box, on a blog that I enjoy reading (http://womenlivingwell-courtney.blogspot.com and GoodMorningGirls.org). I was excited to learn that I WON the contest! I was SO happy because I have never really been someone who wins things so this just really made my day! Here is a quick description about the box that I took from the site where I learned about it. 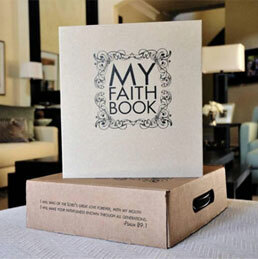 Enjoy reading about the My Faith Box! Even if you can´t afford to buy this amazing tool, it is a great idea to create and make something like this on your own as a way to document your child´s faith journey! 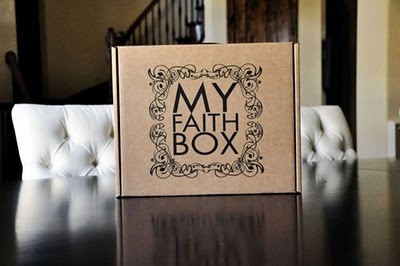 "What is the My Faith Box? I’m so glad you asked! Basically it’s a box that you can decorate and place special keepsakes in, BUT the exciting part is what’s inside the box! Inside is the My Faith Book. What I LOVE about the My Faith Book is how as a parent you can record your child’s faith journey! From birth until age 18, you can record each year how you are praying for your child and create an intentional plan of passing down your faith to your child. Each year contains areas for you to record special memories, what they are learning about God, what they are praying for, favorite bible stories etc. As your child gets older, he/she can then start filling in each year. The book also contains areas for photos as well as areas for older children to personally write about their journey thus far with God. What I love is this book helps create a history of your child’s faith that they can turn back to in later years. The My Faith Book is a tool that can be used to help them remember the faithfulness of God as they flip through the pages and see how God has answered prayers that were written down years before.